After falling to Washington three weeks ago, the Milwaukee Bucks got some revenge by rolling to a 131-115 win over the Wizards at the Capital One Arena. Giannis Antetokounmpo had 37 points and 10 rebounds while making all 17 of his free throws for the Bucks. Brook Lopez added 21 points on 7-of-9 shooting, Khris Middleton added 20 points, seven rebounds and six assists and Malcolm Brogdon added 15 points. Eric Bledsoe was held out of the lineup with a sore left achilles. Tony Snell started in his place and finished with 10 points on 4-of-5 shooting. 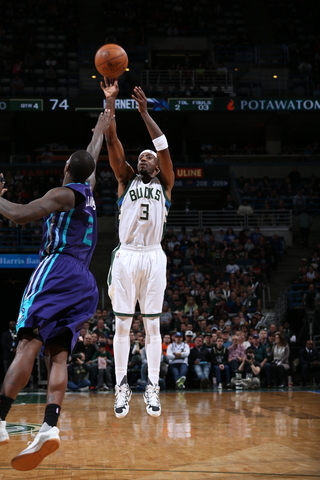 The Bucks (38-13) improved to 3-1 on their five-game road trip, winning their third straight game. They’ll wrap up the road trip Monday night in Brooklyn against the Nets. Washington dropped to 22-30 with the loss. The Milwaukee Bucks have re-signed restricted free agent guard Tony Snell. Snell had the best season of his four-year NBA career in 2016-17, his first with the Bucks. He set new career highs in points (8.5), rebounds (3.1), assists (1.2) and minutes (29.2) per game while playing and starting a career high 80 games. Snell also set new personal bests in 3-point percentage (.406) and field goal percentage (.455) during the 2016-17 season after he was acquired by the Bucks in October. The 6’7 guard has career averages of 6.2 points, 2.5 rebounds and 1.0 assists in 21.4 minutes per game. He was originally drafted with the 20th overall pick in the 2013 NBA Draft by the Chicago Bulls out of New Mexico. 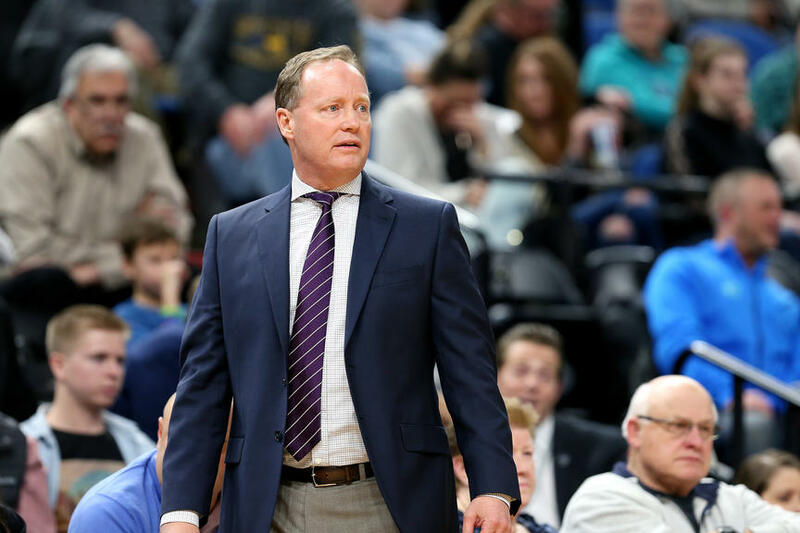 The Milwaukee Bucks closed out the home portion of their regular season schedule by knocking off the Charlotte Hornets 89-79 at the BMO Harris Bradley Center on Monday night. With the win, the Bucks (42-39) clinched a winning record and locked up at least a sixth-place finish in the Eastern Conference. It means the Bucks will likely see a first-round playoff matchup against third-seeded Toronto. Although chances are slim, the Bucks could still climb into the 5th spot in the East by winning the regular season finale at Boston and getting Atlanta to lose both of its remaining games. Giannis Antetokounmpo collected his third triple-double and 8th of his career with 10 points, 11 rebounds and 10 assists. Greg Monroe added 16 points. The Bucks hit 16 of 28 three-pointers, led by Jason Terry, who hit five of seven. Khris Middleton and Tony Snell both hit four of five from distance. Rookie Malcolm Brogdon also returned to the starting lineup after missing five games with a back injury. He finished with five points, four rebounds and three assists in 25 minutes. Michael Kidd-Gilchrist led Charlotte (36-45) with 13 points. Tony Snell scored a career-high 26 points and the Milwaukee Bucks shot 72% from the field in the first half, pulling out a 118-108 win over the Hornets in Charlotte on Tuesday night. It’s the 12th win in the last 15 games for the Bucks (38-36), who remain tied with Atlanta for the fifth spot in the Eastern Conference. Snell hit 10 of 14 field goals, including four of his eight three-point attempts. Giannis Antetokounmpo added 20 points and eight rebounds in the win. The Milwaukee Bucks returned home and held off the Atlanta Hawks 100-97 on Friday night at the BMO Harris Bradley Center, winning for the 11th time in the last 13 games. The Bucks (37-35) moved into a tie for fifth place in the Eastern Conference, tied with Atlanta. The Hawks, who have now lost six straight, still hold the tie-breaker over the Bucks. Giannis Antetokounmpo came through big for the Bucks again, scoring 34 points and adding 13 rebounds and five assists. Greg Monroe had 14 points and 10 rebounds. Malcolm Brogdon had 14 points and seven assists and Tony Snell added 13 points. Dennis Schroder had 28 points and Tim Hardaway Jr. had 25 for the Hawks. Greg Monroe scored a pair of key baskets for the Bucks in the final minute, both assisted by Brogdon. The Bucks are back home on Sunday afternoon, playing host to the Chicago Bulls at the Bradley Center. 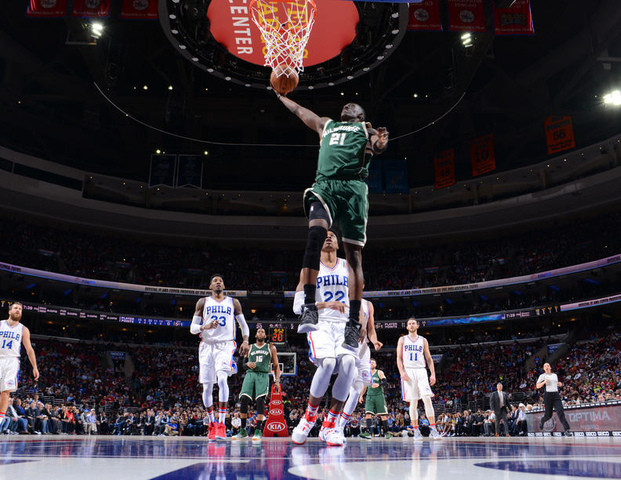 Tony Snell scored a season high 21 points, including 5 of 7 from three-point range to lead the Milwaukee Bucks to a 112-98 road win over the Philadelphia 76ers on Monday night. 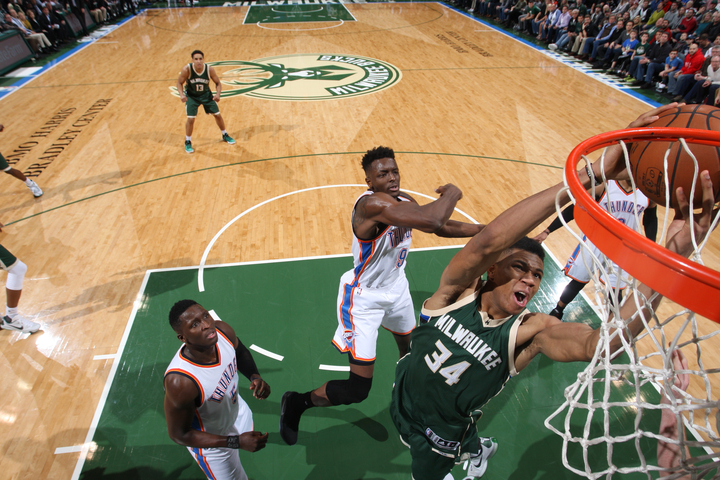 Giannis Antetokounmpo scored 24 points and added eight rebounds, five assists and three blocked shots as the Bucks (29-33) stayed 1 1/2 games out of eighth place in the Eastern Conference playoff chase. The Bucks hit 14 of 33 three pointers as a team. The 76ers got a career high from Justin Anderson who scored 19 points, but fell for the 5th time in the last six games. The Bucks led 60-43 at halftime, and 91-68 entering the fourth quarter. Milwaukee returns home to play the New York Knicks on Wednesday night. They’ll host Indiana and Minnesota on Friday and Saturday. Then they hit the road for the start of a six-game trip, starting in Memphis on Monday before heading west. A Russell Westbrook turnover followed by a pair of Malcolm Brogdon turnovers gave the Milwaukee Bucks a 98-94 win over the visiting Oklahoma City Thunder on Monday night at the BMO Harris Bradley Center. Tony Snell, who went scoreless for the Bucks, slapped the ball away from Westbrook but it hit the Thunder guard’s knee on the way out of bounds to give the ball back to the Bucks. Westbrook, who came into the game averaging a triple-double, had 30 points, seven rebounds and six assists. But Westbrook made just 9 of 28 from the field, including 3 of 17 in the second half. The Bucks got the go-ahead basket from John Henson on an inside feed from Giannis Antetokounmpo. Giannis had 26 points, 10 rebounds and five assists to lead the Bucks (17-16). Jabari Parker added 19 points and six rebounds and Greg Monroe had 15 points and seven rebounds. Thunder big man Steven Adams added 20 points, but only four of those points came in the second half. The Milwaukee Bucks blew a 10-point fourth quarter lead and fell to the Washington Wizards 107-102 on Monday night in Washington D.C. The Wizards outscored the Bucks 21-6 during that stretch as the two teams split their back-to-back matchup. 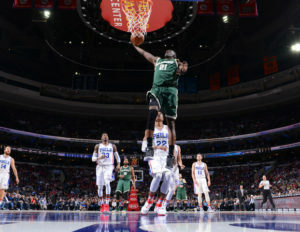 The Bucks beat the Wizards 123-96 last Friday in Milwaukee. Giannis Antetokounmpo had 22 points, 12 rebounds and seven assists for the Bucks (14-15). Tony Snell added a season-high 20 points, hitting a career-high six three-pointers. Otto Porter had 32 points and 13 rebounds to lead the Wizards (14-16). It was the first of a four-game road trip for the Bucks, who will head to Detroit for their next game on Wednesday night.